1911: Giuseppe Mario Bellanca, Brooklyn NY. 1912-15: Bellanca Aeroplane Co & Flying School, Hempstead NY. 1916: Maryland Pressed Steel Co, Hagerstown MD. 1921: North Platte Aircraft Co, Omaha NE. 1922: (Victor H) Roos-Bellanca Aircraft Co, Omaha. 1923: Merged with Wright Aeronautical Co as Wright-Bellanca. 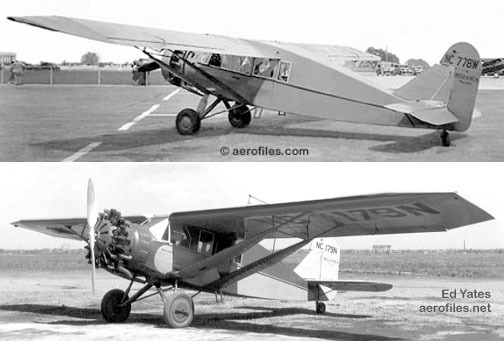 1924: CF production rights sold to Yellow Air Cab Co. 1926: Acquired WB-2 production rights from Wright Aeronautical to form Columbia Aircraft Div, Bellanca Aircraft Corp of America. 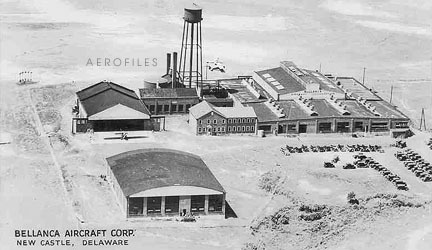 12/30/1927: Bellanca Aircraft Corp, Richmond Hill NY; 1928: New Castle DE. 1955: Production rights to Cruisemaster, including jigs and tools, sold to Northern Aircraft, Alexandria MN. 1957: Northern renamed Downer Aircraft Co, later renamed International Aircraft Mfg Inc (Inter-Air). 1967: Bellanca Sales, subsidiary of Miller Flying Service (Inter-Air). 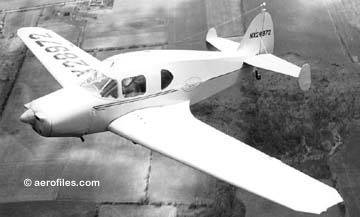 1968: The original Bellanca Co was restarted by Giuseppe Bellanca and son, August, for production of Skyrocket II; work there ended in 1986. 1970: Bellanca Sales Corp; assets of Champion Aircraft Corp acquired, name changed to Bellanca Aircraft Corp. 1978: Subsidiary of Anderson Greenwood & Co. 1981: Liquidation; assets sold to Viking Aviation. 1984: Viking renamed Bellanca Inc, Alexandria. 2002: Assets and production rights acquired by Alexandria Aircraft LLC (consortium of Weber's Aero Repair and four Bellanca empoyees). Bellanca model designations generally were based on specificationse.g. : 14-9 defined a wing area of 14 sqft, and the 9 indicated horsepower, in this case 90hp. Bellanca models appearing in gray type were specified in titles of NASM archival matter and their actual existence or degree of manufacture is unknown. Some were numbered design projects, some were variants and mods and test reports, some with vague titles (Three-Seater Super Fighter, 6 Seater Tandem, etc), many are up for speculation. It will require serious dedication on the part of some researcher who has the time (and NASM's permission) to go through c.100 boxes and bring into the light those mysteries. 1920 (aka Light Tractor) = 2pOB; 35hp Anzani; span: 26'0" length: 17'7" load: 375# v: 85/x/34. Bellanca's entry into the popular post-war lightplane competition. Wing-warping control. $3,500. Wings could be removed in 15 minutes, reassembled in 20 minutes with specially-designed turnbuckles. 1923 = 6pChwM; 90hp Curtiss OX-5. Used surplus Curtiss JN-4 wings. 1923 = 2pOB; 90hp Curtiss OX-5. POP: 2. 1924 = 5pChwM; 150hp Hisso A. 2-12 - Class KD Target Drone. NASM archives. 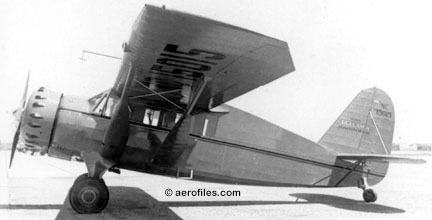 11 Trainer - Development of Aeronca 11 Chief with swept tail, tricycle gear, and other modernizing. Advertised briefly, but did not go into production. 14-7, -9 Cruisair Junior 1937 (ATC 716) = 3pClwM; 70hp LeBlond; span: 34'2" length: 21'1" load: 738# v: 115/105/45 range: 575. Fixed gear. Also available with 90hp LeBlond; load: 700 v: 120/110/45 range: 500. Design evolved into Viking series. 14-7L 1941 = 90hp Lenape LM-5 or Ken-Royce; length: 21'3" load: 700# v: 135/122/47 range: 350-480. $3,975. 14-9, -9L 1939 = 14-7 rg with 90hp Ken-Royce 5-F/G; length: 21'3" load: 680# v: 133/120/45 range: 350-475 ceiling: 14,750'. $3,795-3,975; POP: 44, includes three converted to 14-9L with 95hp Lenape Brave. 14-10L c.1941 = 3pClwM rg; 100hp Lycoming; [NX25307]. 14-12 Cruisair 1941 (ATC 745) = 3-4pClwM rg; 120hp Franklin 6AC-264; span: 34'3" length: 21'3" (?>23'3") load: 658# v: 147/133/47 (?>150/130/45) range: 380-400 ceiling: 12,500'. $3,500-4,500; POP: 13. 14-13, -13W Cruisair Senior 1946 (ATC 773) = 14-12 with 130-150hp Franklin 6A4; span: 34'2" length: 21'4" load: 900# v: 169/154/45 range: 600. $5,375-5,950; POP: 400. 14-13W was "station wagon" configuration in 1949. 14-19 Cruisemaster, Bravo 1949 = 14-13 with rg and 190hp Lycoming O-435A2; length: 23'0" load: 900# v: 210/180/43 range: 680. $9,500. Repowered with 230hp Continental by Downer/International in 1957 as 14-19-3A Bravo (v: 207/167/49); with 260hp Continental in 1959, which was marketed as 260-A, -B, and-C. POP: 114. 17-30, -31 Viking - 4pClwM rg. 17-30A Viking 300 1966 = 300hp Continental IO-520D; span: 34'2" length: 26'4" load: 1134# v: x/185/70 range: 600 ceiling: 17,000'. 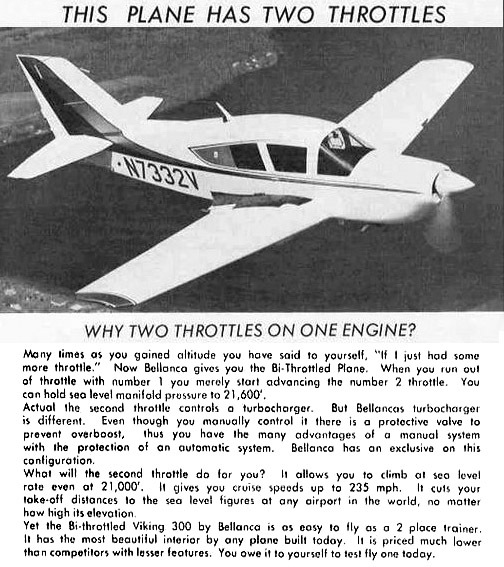 Featured a "second throttle" as described in this 1967 sales pitch. $34,375 (1974); POP: 511 by Nov 1972. 17-30B Super Viking 1968 = 300hp Lycoming IO-540K or 300hp Continental IO-520K; load: 1100# v: x/184/70 range: 600 ceiling: 18,200'. $36,245 in 1974, $56,900 in 1979; POP: 102 by Nov 1972. 17-31 Turbo Super Viking 1969 = 310hp TIO-540K; load: 915# v: 208/202/70 range: 695 ceiling: 20,000. $42,800 (1974); POP: 45 by Nov 1972. 17-110 Interceptor - Allison V-1710-33 (1939). NASM archives. 19-25 Skyrocket II c.1973 = 6pClwM; span: 35'0" length: 26'9" load: 1625# v: x/202/65 range: 1120 ceiling: 26,000'. $60,000 (1974). 19-18 - "Important Technical Information." NASM archives. 20-115 Pursuit, Turbo Supercharger - (1939). NASM archives. 23-80 - "VF High Wing" (1935). NASM archives. 28-70 Flash 1934 = 2pClwM rg; 900hp P&W Wasp SB (originally 700hp); span: 46'2" length: 25'11" load: 4276# v: 270/241/61 range: 800 (4000 with added tanks). 1934 MacRobertson race entry Irish Swoop [7984=EIAZZ], although disqualified, made a record transatlantic flight in 1936 of 13h:17m (p: James Mollison). SEE Bellanca's Hot Flashes for more info. 28-90 Flash 1937 = Prototype mailplane conversion of 28-70; span: 46'3" length: 25'11". Reregistered [NR190M]; sold to Spain, destroyed in civil war. 28-90B 1937 = Production 28-90 as mailplane with flaps. POP: 42, supposedly ordered by France, but most ended up in China and were destroyed by Japanese bombers early in the war. 28-92 1938 = 1pClwM rg; one 420hp Menasco Ranger + two 250hp Menasco C-6S; span: 46'4" length: 27'8" v: 250/225/x range: 3000 with added tanks. POP: 1 tri-motor racer [YRAHA=NX2433], the former registration as Alexander Papana's Alba-Iulia. Finished second in 1939 Bendix (p: Arthur Bussy). Went to South America and ended up rotting away on a small field in Ecuador. 28-110 1938 = 2pClwM rg; 950hp P&W Twin Wasp; span: 46'2" length: 25'11" load: 3679# v: 290/255/62 range: 800. 30-42 Special 1935 = 2pChwM; 420hp Wright R-975. POP: 1 [NR761W] as Clevelander for record attempts. 31-40 Pacemaker Senior 1935 (ATC 578) = 6-8pChwM; 400hp Wright R-975 Cyclone; span: 50'6" length: 27'11" load: 2350# v: 165/145/56 range: 900. $16,800; POP: 6. 31-42 Pacemaker Senior 1935 (ATC 578, 2-509) = Same as 31-40 with motor modification. POP: 4; two in civil use [NC20Y, NC16707], one each to Canada [CFANX] and Norway [LNABO]. (2-509) for twin-float conversion. 31-50, -55 Skyrocket Senior 1935 (ATC 565) = 6pChwM; 550hp P&W Wasp Hornet S3; span: 56'0" (?>50'6") length: 27'11" load: 2450# v: 183/159/60 (?>190/180/54) range: 920. 31-55 was deluxe conversion; v: 187/172/56 range: 750. $22,700; POP 31-50 and -55: about 10 [NC14700/14701, NC13761, NC15015/15016, NC15300, NC15953], of which the last one with 570hp Hornet to USN as JE-1 and exports [CFDCH, XBAAZ]. 33-220 Twin Engine Pursuit - two Allison V-1710-33 (1939) NASM archives. 49-42 Liaison Short Range Observation - NASM archives. Was prototype for YO-50 (1939). 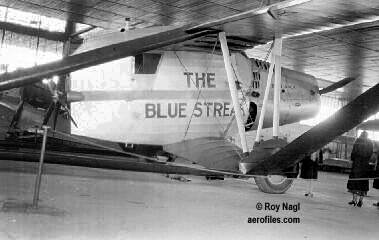 50-210 Trimotor Bomber - NASM archives. 65-75 - "Group Weight Statement, From Actual Weights of Bellanca C-27B." NASM archives. 66-67 Aircruiser, Airbus 1935 (ATC 2-519) = 10-15pCswB; 675hp Wright SR-1820 Cyclone. POP: 1 conversion from P-200 Airbus [NC10796=CFAWR]. 66-70 Aircruiser 1935 (ATC 563, 2-508) = 17pCswB; 710hp Wright SGR-1820 Cyclone; span: 65'0" length: 43'4" load: 4870# v: 165/155/58 range: 700. 2p cargo version had load: 6100# v: 165/150/65 range: 540. $31,600; POP: 5 to Canada [CFAWR, CFBKV, CFBBJ, CFBLT, NPC41=CFBTW], the last one first registered in the Philippines. There exists an unresolved question about the similar 66-67 reg for [CFAWR]. (2-508) for 660hp SGR-1820 and twin EDO floats. 66-75 Aircruiser 1935 = 11-14pCswB; 730hp Wright Cyclone; load: 5285#. $35,800; POP: 3. 66-76 Aircruiser 1935 = 2p cargo version of 66-70; 760hp Wright Cyclone; load: 5042# v: 172/162/60. 66-85 Aircruiser 1935 = Same as 66-76 with 850hp Wright Cyclone. 66-87 Patrol Utility Airplane, Class VPJ - (1939). NASM archives. 66-90 Patrol Utility Airplane - NASM archives. 77-140, 77-320 Junior 1934 = ChwMF; two 715hp Wright R-1820 Cyclone; span: 77'0" length: 40'0" load: 8117# v: 190/172/58 range: 1500. Wood and fabric over steel-tube construction; W-strut airfoils with leading-edge motors. Twin-engine development of P-300 as a prototype for a military bomber, 77-320 was a modification to twin 32' floats. POP: Dan Hagedorn's Latin American Air Wars and Aircraft 1912-1969 claims delivery of four 77-140s to Colombia in 1935-1938, c/ns 1201/1204. 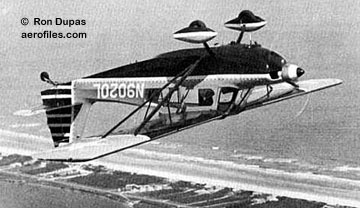 77-160, -170 - Twin Float Monoplane (1935). NASM archives. 115-200 - Bomber (1935). NASM archives. 300-W Pacemaker 1930 (ATC 328) = 6pChwM; 300hp P&W Wasp Jr; span: 46'4" length: 27'10" load: 1835# v: 145/122/50 range: 730. $15,550; POP: 7 [NC76W, NC353W/355W, NC11694, NC12617, x], and 1 modified from CH-300 [NC33M]. Aries T-250 1973 = 4-5pClwM rg; 250hp Avco-Lycoming O-540; span: 31'9" length: 26'7" load: 1310 v: 216/201/x range: 1180. T-tail. 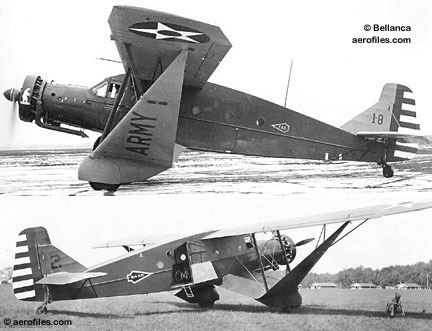 C-27 - USAAC version of P-200 and P-300. Y1C-27 1932 = 550hp P&W R-1860 Hornet; span: 65'0" length: 42'9" load: 3928# v: 136/115/x range: 570 ceiling: 14,500. POP: 4 [32-399/402]. 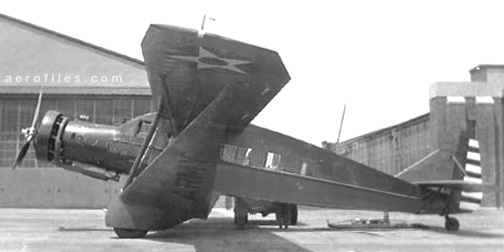 C-27A 1933 = 650hp R-1860-19. POP: 10 [33-18/27]. C-27B 1933 = C-27A with 675hp Wright Cyclone F. POP: 1 [33-19]. C-27C 1933 = C-27A with 750hp Wright Cyclone. POP: 9 [33-18, -20/27]. CD 1917 = 2pOB; 35hp Anzani; span: 26'0" v: 75-85. Wing-warp lateral control, small front cockpit; partly-cowled motor; ff: 9/x/16 (p: Giuseppe Bellanca. CE 1919 = 2pOB; 45hp Anzani; v: 102/80/38. Improved CD with ailerons, two full-size cockpits. 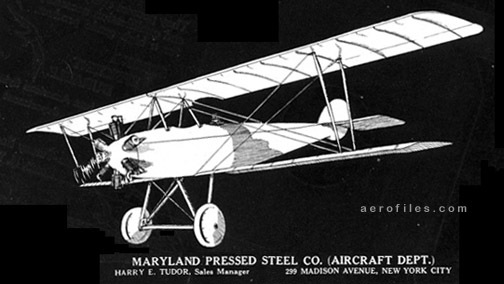 POP: 2; one 1p known as CE Sport [302V], and several incomplete constructions, purchased at auction by Clarence Chamberlain when Maryland Pressed Steel Co filed bankruptcy in 1920. CF, SE Sport, Air Sedan 1922 = 5pO/ChwM; 90hp Anzani; span: 40'0" length: 23'10" load: 1040# v: 108/95/40 range: 480; ff: 6/8/22 (p: Harry G Smith). First of the signature "flying strut" models; glide ratio of 12:1. Pilot in open cockpit aft of wing. Won first place awards for speed and efficiency in every event entered in 1922-23, including the 1923 Nationals. POP: ? [3682, 4057, 11036]; 1 as SE Sport . Rights sold to Yellow Air Cab Co in 1924, but none was produced by that company. CG - "Preliminary Figures given to Wright in 1925." NASM archives. CH-200 Pacemaker 1928 (ATC 47, 2-238) = 6pChwM; 220hp Wright J-5; span: 46'4" length: 27'9" load: 1860# v: 126/106/46 range: 700-800. $14,050. First Bellanca with an ATC. 1928 endurance record (35h:25m) set by Reliance (p: Lt Royal V Thomas) [NX4484]. (2-238) for 3p Special [NR782W] with 225hp Packard DR-980 diesel; it flew on 5/25-28/31 for 84h:32m without landing for fuelthat record for diesel engines has never been broken (SEE Chronology). Its registration indicates Bellanca J-2 c/n 1101, a confliction that needs to be resolved. CH-300-W Pacemaker 1929 (ATC 2-52) = 6pChwM; 300hp P&W R-985 Wasp. POP: 1. CH-400 Skyrocket 1930 (ATC 319, 2-205, 2-213, 2-226, 2-293) = 6pChwM; 420hp P&W Wasp C; span: 46'4" length: 27'10" load: 2008# v: 155/134/55 range: 670. $17,800-20,000; POP: 32, of which 3 to USN as RE. Approvals for 450hp P&W Wasp were (2-205) for [NC179N], (2-213) for [NC548V], and (2-226) for [NC547V]. On 7/28/31, Miss Veedol (p: Clyde Pangborn & Hugh Herndon) attacked the Wiley Post around-the-world speed record, but were forced down in Wales, then continued as far as Japan, from where they made the first non-stop transpacific flight, 4,500 miles from Samishiro to Wenatchee WA [NR796W]. Renamed American Nurse in 1932 and was lost at sea. SEE Miss Veedol page. Champion, Citabria (TC A21CE, ATC 761*) - Upgrade and modernization of 2pChwM Aeronca 7 designs from Aeronca and Champion companies. Confusion for researchers is prevalent with the generic use of "Champion" and the Champion Aircraft Co. *ATC 761 was originally for 11AC/11BC Chief, and we don't understand how it dovetails into this production. Champion 115 19?? = 60hp Franklin 2A-120B. This is a questionable model number that appears in some references, perhaps a temporary assignment by the factory or from an advertisement, and is very likely 7ACA. Champion 7ACA 19?? = Aeronca 7-AC production with cantilever gear and other upgrades. 60hp Franklin 2A-120B; span: 35'2" length: 21'10" load: 470# v: 98/83/39 range: 300. Citabria 7ECA, Standard, Standard II 19?? = Aerobatics- approved version of Champion 7ACA with 115hp Lycoming O-235-C1; span: 33'6" length: 22'8" load: 464# v: x/115/51 range: 570 ceiling: 12,000'. $9,095. There is no record of production for Standard II with 115hp O-235-K2C. Model name is "airbatic" spelled backwards, if you hadn't figured that out on your own by now. Citabria 7GCAA, 150 19?? = Continuation of Champion Citabria. 150hp Lycoming O-320A; span: 33'6" length: 22'8" v: x/125/51 range: 455 ceiling: 17,000'. $11,400. Citabria 7GCAB 19?? = Deluxe 7GCAA. Citabria 7GCBC Scout 1971 = Announced as specialized aerobatic and agricultural version. 150hp Lycoming O-320-A2B; span: 34'6" length: 22'8" load: 500# v: x/125/40 range: 537. $12,090. Production ended c.1975, replaced by 8GCBC. Citabria 7KCAB 19?? = 150hp O-320E; span: 33'6" v: x/125/51 range: 455 ceiling: 17,000'. $12,665. Citabria 8GCBC Scout 1975 = Enlarged and strengthened utility and agriculture version of 7GCBC with 180hp O-360-C2A; span: 36'3" length: 22'9" load: 830# v: 135/130/52. $16,995 (1974); $1,952 for Sorenson sprayer option. Removeable rear seat and control stick for cargo duty. 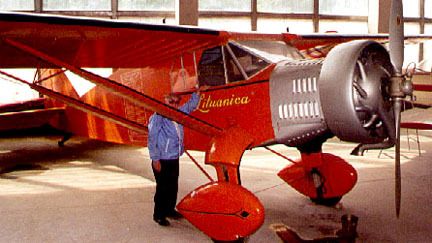 Citabria Aurora 1995 = Development of Standard. 118hp Lycoming O-235-K2C; span: 33'6" length: 22'9" load: 500# v: 121/116/50 range: 640. $59,900 (1998); POP: 11 by the end of 1997. Decathlon 8KCAB 19?? = Continuation of Champion 8KCAB Citabria with name change. 150hp AEIO-320-E1B; span: 32'0" v: x/132/53 range: 591 ceiling: 16,000'. $17,490. 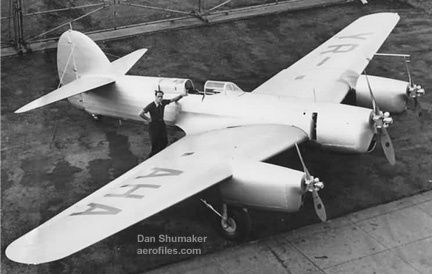 D Skyrocket 1932 (ATC 480) = 6pChwM; 450hp P&W Wasp SC; span: 47'6" length: 27'11" load: 1980# v: 170/145/60 range: 700. POP: 7, of which 1 to USN as XRE-3. de Havilland DH-4 Modified - NASM archives. E Pacemaker 1932 (ATC 476) = 6pChwM; 420hp Wright R-975; span: 47'6" length: 27'10" load: 1950# v: 150/125/55 range: 700. POP: 7, of which 1 [NC13187] had 330hp Wright J-6, and 1 [NS5Y=NS59] modified to 450hp D Skyrocket. 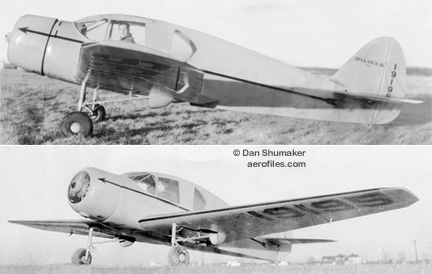 F Skyrocket 1934 (ATC 2-475) = 6pChwM; 550hp P&W Wasp S1. POP: 3 [NC57V=XHTAS, NS14342, x]. F-1, F-2 Skyrocket 1933 (ATC 2-459, 2-462) = 5-6pChwM; 420hp P&W Wasp SC. POP: 2, with 1 [NC2608=NC26] refitted with 450hp Wasp and converted to F-2 for increased load capability under (2-462). J 1929 = 2pChwM. First plane built in the new Delaware plant was Pathfinder [NX3789] for a transatlantic flight to Spain on 7/9/29 (p: Roger Q Williams, Lewis Yancey). They had tried earlier in [X5315] Green Flash, but suffered a landing gear collapse on takeoff. POP: 4 [NX3789, 4483, X5315, 7085]. J-300 1931 = 2-4pChwM; 300hp Wright. In late June 1931 Liberty was the fourth Bellanca to make a transatlantic flight, Newfoundland to Krefeld, Germany (p: Otto Hillig & Holger Hoiriis); planned target was Copenhagen, but heavy fogs forced them off course [NR797W]. On 7/28/31, Cape Cod (p: Russell Boardman & John Polando) flew from NYC to Istanbul for 5,014 miles in 49h:19m, squeaking in with only ten gallons of fuel remaining [NR761W]. On 5/15/34, Leonardo da Vinci (p: Cesare Sabelli & George Pond) tried for Italy, but barely made the coast of Ireland [NR13137]. These and several other record flights made Bellanca's reputation most enviable. Other regs were [782W, 13199], the last one seen also as J-3-500. J-2 Pacemaker SEE CH-200 Pacemaker Special ID problem here! J2 Tradewind Special 1930 = 2pChwMF; 300hp Wright R-985. POP: 1 [NR766W] s/n 3002, custom-built for William S MacLaren and Beryl Hart for a planned transatlantic flight; fuel capacity was 400 gallonsfour wing tanks and one in the fuselage. However, MacLaren never paid for it! Bellanca filed suit, but MacLaren transferred title to Mrs Hart, so they could not place a judgment on the plane. The two of them took off for Paris with scheduled stops in Bermuda and the Azores, but the last seen of the pair was departing Hamilton Harbor, Bermuda. Apparently they are still with their purloined plane somewhere on the bottom of the Atlantic. JE 1938 = Similar to civil 31-42; 570hp P&W R-1340; span: 50'6" length: 28'6" v: 185. Gross wt: 5595#. 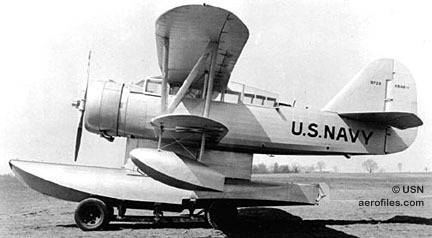 POP: 1 for USN as JE-1 . K 1928 = 12pCswB rg; 500hp P&W Hornet; span: (upper) 64'6" (lower) 36'8" length: 39'1" load: 6000-8000# v: 140/115/41 range: 5500. POP: 1, as Roma for abortive transatlantic attempt [NX4864], renamed Enna Jettick in 1932. 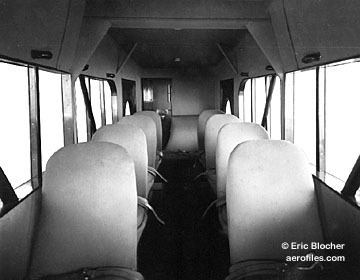 M Transport - NASM archives. 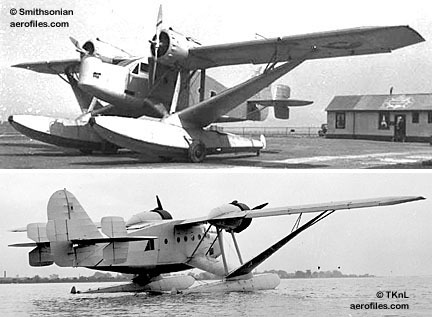 MP-901 Canadian Mailplane - NASM archives. O-50 (Model 49-42) 1940 = USAAF observer with slots and flaps. 2pChwM; 420hp Ranger V-770; span: 34'2" length: 21'3" load: 700# v: 133/120/43 range: 410. POP: 3 as YO-50 [40-741/743]. P 1928 = Commercial version of K; load: 4350# v: 130/110/54 range: 700. Basis for Airbus series. 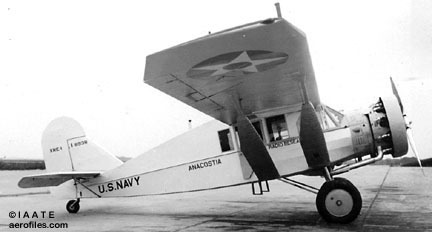 P-2 "Army" - NASM archives. P-100 Airbus 1930 (ATC 360) = 12-14pChwM; 600hp Curtiss Conqueror; span: 65'0" length: 40'8" load: 4010# v: 145/122/55 range: 700. 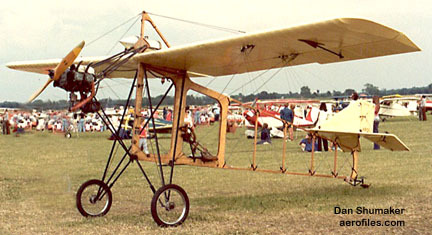 Almost the full equivalent of a sesqui-wing with its large lifting struts; two-bladed prop at first, then three-bladed. $37,500; POP: 1 [NC684W=XABHO], converted to P-200. P-200, P-200-A Airbus 1931 (ATC 391) = 12-14pChwM; 575hp Wright Cyclone; span: 65'0" length: 42'9" load: 4435# v: 140/122/55 range: 720. $32,900; POP: 5 [NC785W/786W, NC10796/10798]plus 4 to AAC as Y1C-27 with 550hp P&W GR-1860and 1 conversion from P-100 [XABHO]; [NC10796] converted to 66-67. P -200-A was 12pChwMF version; load: 3800# v: 135/115/60. Refitted in mid-1931 with 650hp P&W Hornet. P-300 Airbus 1932 (ATC 391) = 15p deluxe P-100 with 575hp Wright R-1820 Cyclone. POP: 20 to 25, of which 10 to AAC as C-27A. Available in 1933 with 650hp geared P&W Hornet. Evolved in Aircruiser series. PM-300 Pacemaker Freighter 1929 (ATC 245) = 3p cargo version of CH-300; 330hp Wright R-985. $15,000; POP: 2 [NC257M=NS2Y=NS5, NC870N=CMAFL]. RE - USN version of CH-400 with similar data. XRE-1 1932 = Radio research. POP: 1 [A8938]. XRE-2 1932 = POP: 1 . RE-3, XRE-3 1932 = POP: 1 . Modified as a two-litter ambulance and transferred to USMC as XRE-3. SE - Carrier-based scout. 2pChwM; 650hp Wright R-1820F; span: 49'9" length: 29'11" v: 172 ceiling: 21,200'. Folding wings. XSE-1 1932 = POP: 1 [A9186]. 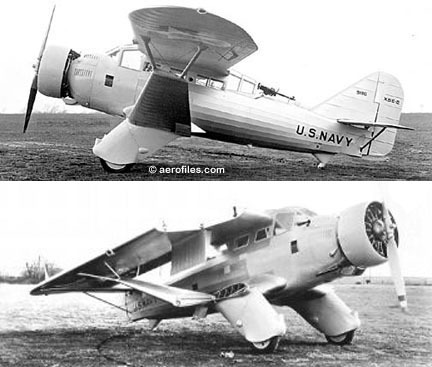 XSE-2 1934 = SE-1 with a stronger fuselage, larger fin, R-1510; ff: 12/23/34. POP: 1 [A9186]. According to Ostrowski in Skyways, XSE-1 crashed to destruction before delivery to USN. 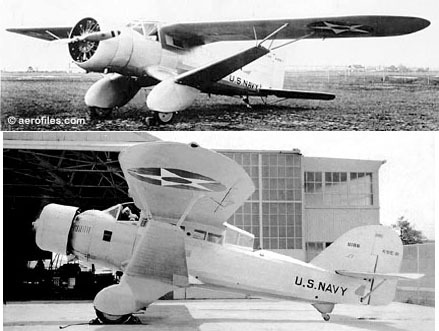 XSE-2 was a new airplane, but with the same s/n as XSE-1. Just to rankle historians? SOE 1936 = Single-float USN scout. 2pCBF; 725hp Wright R-1820; span: 41'0" length: 34'11". POP: 1 as XSOE-1 . Although assigned a s/n, it was ultimately not accepted by USN. T-14-14 1940 = 2pOlwM; 130hp Franklin 6AC-298; span: 33'2" length: 24'6" load: 705# v: 130/105/45 (?>128/113/45) range: 375 ceiling: 14,000'. Bonded plywood cantilever wing. $7,000; POP: 1 trainer for unsuccessful military evaluation; based on the Cruisair design [NX/N28994]. T-14-15 Trainer - (1948). NASM archives. TES Tandem aka Blue Streak 1929 = 1pChwM; two 450hp P&W Wasp pusher/tractor in tandem; span: 83'2" length: 44'2" (25'0" fuselage) range: 5000. Almost prehistoric-looking creation had 2200-gal fuel tanks for proposed endurance flights. Twin-booms, triple tails, wide lifting struts. Engines drove three-bladed props in front and rear of cabin nacelle; refitted in 1930 with two 600hp Curtiss Conqueror as Chicago Daily News Blue Streak [X/NR855E]. Destroyed in a crash when the extended propeller shaft broke. VF - "Navy Two Seater or Single Seater Fighter of High Wing Type" (2/28/32). NASM archives. Was a contract variant of Boeing F4B-3? XPTBH-2 - "Detail Specification for Twin Float Monoplane, Class VTPB" (1/23/35). NASM archives.